Freely download, share & copy; not for commerical gain. Professor Hasegawa Kai is the author of over 20 books of haiku criticism and is an award-winning poet. He currently holds a post at the Yomiuri Newspaper as a reviewer of haiku and other literary and cultural works. 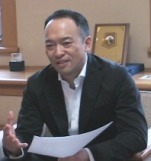 He frequently serves as a judge of national haiku contests. Haiku Cosmos 2 — Venturing into the heart of what constitutes haiku as a literary genre, Hasegawa discusses kire (‘cutting’), and ma. One way of thinking about kire is that it cuts through space and time — a primary, defining feature of haiku, intrinsic to its composition. Hasegawa draws significantly on the philosophy of Bashô, for whom kire was of vital importance. Also discussed is zengo no kire (‘before’ and ‘after’ kire), a type of cutting which ‘cuts’ the haiku from normative reality, just before the beginning and after the ending word or sound. Unfortunately, ma resists easy translation. Hasegawa discusses several culturally familiar types of ma, before pursuing the topic of psychological ma as instrumental to excellent haiku. We have translated ma severally as: “interval of betweeness,” “psychological interval (of time/space),” “between dimensions,” “the arising of psychological space,” and “creative imagination” (cf. James Hillman's monograph, The Thought of the Heart and Soul of the World).